Copyright © 2002-2004 Michael Anderson. All rights reserved. 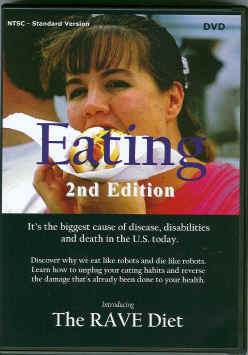 If you’re tired of all the hype and destructive misinformation out there and want facts that could save your or your loved ones’ health, Eating is must viewing. The video presents many professionals and others who discuss how they have used this whole plant food diet to cure and reverse most chronic diseases, and to prevent their reoccurrence. Eating, 2nd Edition: Introducing The RAVE Diet presents graphic evidence of how animal foods are not meant for human consumption, and how the suffering and death of the animals "takes revenge" on the humans who eat them by causing most of our chronic diseases, and how the switch to a all whole-food plant based diet can begin to reverse many of these diseases in as little as three weeks. We strongly recommend this excellent video.